We meet you at Cairo airport and transfer you to a 4 star hotel (normally the Barcelo pyramids). The rest of the day is free for you to settle in and relax. We enjoy a full day tour today to the majestic Pyramids and Sphinx at Gisa, and also to the famous Egyptian Museum. In the evening we transfer to Dahab on the overnight coach. After arriving in Dahab and checking into your hotel, we take you to the dive centre, Dahab Divers which is located in the Lighthouse area of Dahab where we will introduce you to the team there.They will go through the various components of the Open Water and Advanced courses with you and then you will begin the course after this. You will now do your remaining 2 open water dives required in order to complete the course. You will also be required to do a final exam which you will need to pass in order to become a PADI Open Water Diver. Once you have completed your Open Water course the remainder of the day is free before starting the Advanced course tomorrow. You start the Advanced Open Water Course today which consists of 5 speciality dives. There are two speciality dives which are compulsory and then the other 3 can be chosen by yourself and your instructor. The two dives which must be completed for the course are the underwater navigation dive and a deep water dive. We continue with the Advanced Open water course today doing the dives that you and your instructor have chosen. There are a wide range of speciality dives you can chose to do from Underwater Naturalist to Night Diver. Today will be the last day of the Advanced Open water course when you will do the remaining dives which have been chosen by yourself and your instructor. There is also a manual to accompany the course which you will need to read and also an exam to be successfully completed at the end. You may need to finish any theory or dives today but after this the rest of your time in Dahab is free. You can arrange to do some extra dives with the dive centre as you will now be an Advanced Diver you can dive more of the dive sites of Dahab such as the Bells and the Canyon which are 30 metre dives and can only be done by advanced divers. 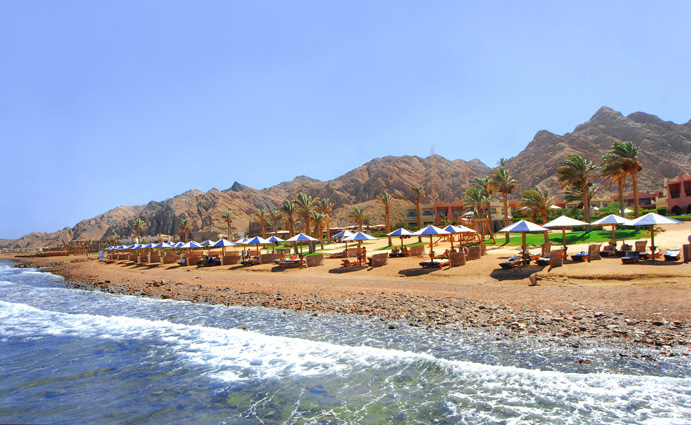 You have another free day today to do some more diving or you can try out some of the other activities and options available in Dahab, such as the Jeep Safari to the Coloured Canyon, quad biking or horse riding which can all be arranged locally. This evening we take the overnight coach back to Cairo. After arriving in Cairo and checking into your hotel, we have a short city tour today to explore the mosque and museum at the Citadel, overlooking the city, and to wander around and possibly do some haggling and souvenir shopping in the busy Khan-el-Khalili bazaar. In the evening we include a sunset felucca ride on the Nile. The tour ends today and your time is free until we transfer you to airport for your flight home. You can add extra nights in Cairo if you wish to explore the city further. Hotel accommodation in Cairo and Dahab on bed and breakfast basis. Listed below is a selection of optional extras that can be added to your tour. Just select which options you want to add to your booking when you reserve your tour, or alternatively just let us know and we'll add them to your booking. Further options are also available when you get to Egypt (such as Sound & Light shows, dinner cruises, scuba-diving courses).